You work hard to build your blog and increase social media and organic traffic from search engines. But one symptom of your success is going to be a lot more blog comment spam and unwanted contact form messages. As your site ranking improves, you will start to get noticed by genuine content marketers, as well as spammers. SEO tracking software is now very sophisticated, and when it notices your site improvement, it will add it automatically to a list of potential backlink prospects. Reputable marketers use this data to pinpoint who they can contact to improve content, backlinks and sales potential. But spammers and scammers use these automated tools to hit hundreds or thousands of sites. There are two types of links a site can give. A rel dofollow and rel nofollow. A dofollow link is the most useful and passes on link juice to a site. A nofollow link does not pass on juice but is still useful in helping a site rank. All comment links are nofollow. It’s not easy getting a site owner to give a dofollow link, so a comment spammer is trying to get a quick rel nofollow link from your site and hundreds of others by using automation. The other aim is to have comments including links to unsavoury sites and scams published in the comments section of blogs. You contact form on your site can also be automatically accessed with software. The most common use is to ask you to add content to your site or for you to add a dofollow backlink to a blog post. As you site rank improves, you can expect the percentage increase in comment and contact form spam to be double that of your traffic growth. The best defence against a lot of spam is to be prepared and have your site ready to handle this fact of life increase in unwelcome traffic. There is one simple way to avoid comment spam. Don’t have comments on your site. But this is a bit radical, as legitimate comments add social proof to your blog posts. You can also use external comment systems such as Disqus or wpDiscuz. Some of them offer the option to integrate social networks. However, with external systems, you lose some control, and your comment data could be used for advertising purposes. Yes, nothing is really for free. If you want comments on your site using your blog’s inbuilt system, all you need to do is take a few precautions. For a WordPress website, the very first step is to make sure you are using a plugin to stop most of the spam. Akismet is by far the best and has a user base of over 5 million sites. If you don’t have it installed already, go to your WordPress dashboard and click on plugins in your menu, and then add new. Search for Akismet and then install. You will then need to register, but it is free. As you can see from our site stats above, we get a lot of spam, but just over 99% gets blocked by Akismet. All we have to do is catch the less than one per cent. If you have a URL or website text box in your comment form, remove it. You only need name and email. For spammers looking for a backlink, it is easy pickings. By removing this box, you will reduce the attractiveness of your site to spammers, and you will get a lot less spam. To your regular and new commenters, it won’t matter at all. You can remove the URL box with a plugin or with code. If you need help, this article on Cloudways gives you all the details. Spam filtering and protection are not enough. Spammers are smart and will try all sorts of ways to get comments approved on your site. Very often they post what looks like legitimate comments to see if they get them published on your site. If it works, then they will add comments including links. The only sure way to stop every type of spam is to use comment moderation. It might sound like it is time-consuming, but it isn’t really. I get a lot of comments, but with Akismet and no URL box, it reduces the need for moderation to only genuine comments and looking for a few suspicious ones. To set up moderation, go to Settings and then Discussion. Now you will receive an email notification for all comments. You can now approve, or not, every comment you get. Be on the lookout for very short comments with a suspicious looking email address. Comments such as “Nice blog, sir” with an odd name or email are prime candidates for the spam button. It is your blog, so you want to be in control and make sure that comments added on your blog posts add value and promote genuine conversation and interaction. A few minutes a couple of times a day is a wise time investment to maintain a high-quality standard for your blog and your visitors. On other blogging platforms, you will find similar tools. On free blogs such as Blogger, anti-spam is inbuilt. You might be able to remove the URL box, but you will undoubtedly have the option to moderate your comments. To add a contact form to your site, you need to install a contact form plugin. Two of the most popular are Contact Form 7 and Caldera Forms. Whatever form builder you use, you generally use drag and drop to add form fields such as Name, Email Address, Phone Number, Subject and Message. 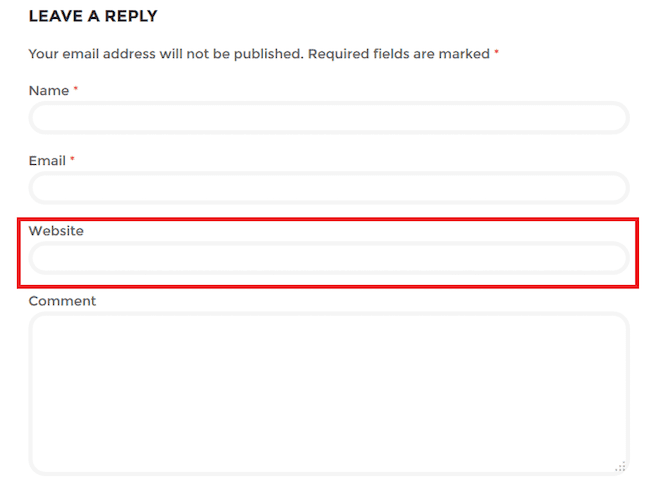 You can set fields required and modify the submit button. Most use the inbuilt WordPress wp-mail function in wp-admin. Contact forms are easy to create, and you only need to add a new page and add the contact form shortcode, or for some, there is a button in the editor for add contact form. Some form plugins offer page, post or widget placement. If you really have a problem with contact form spammers, Contact Form 7 has a Google reCaptcha option. I have just updated our contact form to include reCaptcha after a huge spammer attack that was hitting our site over 2,000 times a day. There are many options you can add to a contact form by editing each input field with a radio button selector, dropdown list or only display selected data. You can also edit buttons text. No matter how you design your form, the real control comes in how you set up your notifications. You need to add your email address to the send email function. This will notify you of every new contact form message you receive. In your plugin settings, you can design it so that it is displaying contact name, email and message or any other information you want to get via email. It’s a good tip to use a different email address so you can get all the messages in one account or inbox. If you only get a few messages a day, that’s all you need to do. But what if you get one hundred or more messages a day? You are going to get a notification for every new message, but not all of them need a reply other than to say, no thanks. If you want to save a lot of time and energy, the best approach is to use an autoresponder. I use Caldera Forms, and it works perfectly. Go to Processors, and click Add Processor and select Autoresponder. Now you can write an auto-reply message that will be sent in reply to all of your contact form messages. You can even personalise it with the senders first name. In your message, make it clear what action you are going to take and not going to take. We use this message on our site. We get a lot of messages every day, and we are grateful for your comments and suggestions for improvements to our website. We read every message we receive, but we are sorry that we can’t respond to all of them. If you feel you have a story that is well suited to be published on Just Publishing Advice, or if you want to place a link on our website, we welcome your suggestions, which we will consider carefully. However, if you don’t receive a response within one week, it’s safe to assume that your content was not selected for use on our site. In a nice friendly way, we are saying that if it is a comment about our site or a suggestion for improvement or there is a feature problem, we’ll reply. But if you are asking to add content, well, wait a week, but please don’t send us ten followup messages. With an autoresponder in place, it reduces all the unnecessary responses you might have had to write and send. You can concentrate fully on the messages that are important and need your attention. It also dramatically reduces follow up requests because it is clear what is going to happen. Our site gets a lot of automated contact messages from marketers. So this solution makes it much easier to manage, as we only need to reply to genuine senders and to content suggestions that are appealing to us. Spammy computer-generated mass messaging usually sets a reminder if no reply is received. An autoreply, on many occasions, does the trick because the program registers a reply. Depending on what blogging platform you are using, you will have at least some tools to combat spam. On WordPress blogs, there are many options and ways to manage the issue. In either case, what is important is that spammers are not going to go away. So you need to take the best course of action to protect your site or blog. In general, however, moderating your comments is the best way to stay in control, and an autoreply on your contact form will reduce the need to respond to unwanted comments.